Inspiration for the dialogue and lyrics for Rockville 2069 came directly from the culture and the parlance of the 60s. The decade was a watershed moment in history and it is only with hindsight one is able to see this. The effect of the events of the time on, inter alia, world views, culture, music, literature and mores, was dramatic and caused seismic shifts which are still with us today (and, in my humble opinion, will still be with us in 2069). The post-war generation had grown up with continual conflict somewhere in the world and the turmoil that manifested itself in Indo-China, in Africa and in South America in the 60s led to wide-spread demonstrations on both sides of the Atlantic as young people called for a kinder world than the one they had inherited from their parents. The spirit of civil unrest and disobedience is palpable in the events of the musical but so is the desire for a calmer, more nurturing world, although the focus is more on the catastrophic effects that climate change will have on the world if we don’t do something about our cavalier attitude straight away. 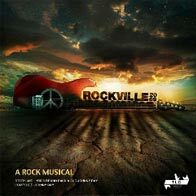 For all this, Rockville 2069 is not meant to be preachy in any way, but rather is hopefully a great entertaining night out with dancing and singing … and a message of peace and hope for the world thrown in for good measure.